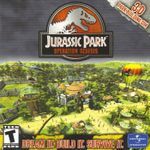 In March 2003, Vivendi Universal Games released a game developed by Australian company Blue Tongue Entertainment very much similar to Jurassic Park III: Park Builder. The game titled Jurassic Park: Operation Genesis allows the user to recreate their own Jurassic Park featuring 25 dinosaurs and a multitude of rides, shops and other attractions. The game was released on Xbox, PlayStation 2 and PC. This game is similar to the popular simulation game, Zoo Tycoon. The dinosaur's behavior was researched in more detail than its predecessors; the Jurassic Park Institute helped in this task. Source: Wikipedia, "Jurassic Park video games", available under the CC-BY-SA License.